We recently posted an article about Facebook ‘Like’ scams and the truth behind them. This post talked about how some parties created fake pages to invoke sympathy and got hundreds of thousands of likes and comments as a result. This in turn enhanced the Edge Rank of a page and spread as spam to even more Facebook users. This post now explains steps on how to prevent such messages from appearing in your news feed. These steps will be useful, if you often find your news feed overflowing with such posts, or posts that claim your friends have recommended something by liking it. You can resolve this in different ways. But in most cases, these friends are not even aware that their actions are causing spam or recommendations to reach your news feed. If you find that a lot of spam has reached you through a specific individual, you should probably inform him/her about this. STEP 1: Click on the tiny scroll-down arrow that appears in the top-right corner of a news feed item to see a list of actions. If you click on ‘Report Story or Spam‘ the post will be dealt with by Facebook. STEP 2: If you click on ‘Hide…‘ you will see the following message. This implies that the item has disappeared from your news feed and you can choose to ‘Unhide‘ it as well. STEP 3: If you hover your mouse over ‘Change what updates you get‘, you can select the kind of news feed updates you will receive from this person. 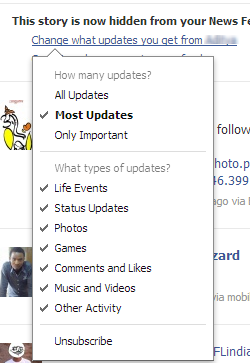 You can select ‘only important’ updates, any combination of various updates or unsubscribe from the news feed completely. STEP 4: However, if you click on ‘Organize who you see in news feed‘, you will see the various lists that have been created. This can also be viewed via the left-side column of your news feed page. STEP 5: You can now add and remove friends from these lists and also decide what kind of updates will be received from them. Additionally, other lists based on any parameter can be created as well. These simple instructions on how to deal with such spam messages and avoid Facebook ‘Like’ scams can be implemented by anyone. Anti-spam software is unable to deal with such threats so it is crucial to be aware of these risks and how they can be avoided. In a worst case scenario, you can simply unsubscribe completely from a friend’s activity or block/unfriend them on Facebook for good. Can somebody hack or trouble my system just from facebook or by using facebook chat. If ‘Yes’, then how to get rid of those things! Thanks QH….very informative & useful info. This is helpful to know how to escape from unwanted news and scamenews. Thanx for da information.Hope we shall get more and more such news in future. Really nice information Rahul Thadani,if any other information like this please share with all. I just knew how to organize type of news or what we just only wanted to know from a friend or page (photos or daily life, status etc.) But The step 5 ifs somethinf worth knowing! श्री मान,Rahul Thadani जी समय समय पर उपयोगी जानकारी देने के लिए बहुत बहुत आभार आपका…..
thank you quicheal for that hints. this is a nice hints to me. i shall follow it. i want to remove some friend from my friend list but i cannot do that how i can do that? how i can remove a bunch of friends from my facebook friends list. Visit the profile page for the friend you wish to remove. In the top right there is a box that says ‘Message’. 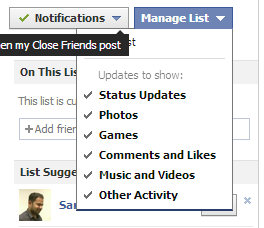 Click the drop-down arrow next to that and then select ‘Unfriend’. Chatting in any environment be it any mail server or social network is not safe always. Spammer & Hacker always wait for these opportunities. You must have installed paid anti virus with fire wall facility to deal hard with hacker. Thanks rahul for one more like scam of FB post. Really helpful information, thank you so much sir and this process i perform on my FB account and its really work. I hope that your information will be very helpful for the new FB users. Hi.. i would like to ask u one thng.. What should i do if i want dat no one else thn my facebook frnds get notification of my activities. For ex: if a frnd of mine liked or commented on my photo..thn his frnds cn see dat activity in their news feed. bt what should i do so that thy cannot even look at my photos as thy r nt in my frnd list..evn if in my privacy settngs i hv enabled visibility only to my frnds. If you have enabled visibility of your photos only to your friends, then only they will be able to see it. However, if a friend of yours tags you in his photos then he controls who sees those pictures. His friends will be able to view his photos. If you are tagged in them and wish to not be seen, you must ask him to untag you or to remove the photos altogether.